The much-discussed US student loan debt load has hit $1.2 trillion, and in spite of government-sponsored debt forgiveness and other measures, it isn’t likely to shrink. 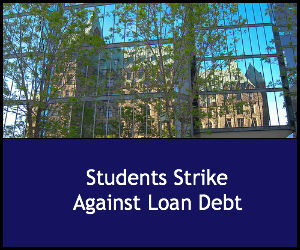 Now, a group of students is taking matters into their own hands by simply refusing to pay off loans they claim is predatory and excessive. The Corinthian 15, as the group of rebels is being called, are students who were enrolled in the troubled for – profit Corinthian College system, which includes several campuses. Claiming they were manipulated into taking out loans and subjected to high-pressure tactics by Corinthian, they took the radical step in late February 2015 of telling the Department of Education that they simply were not going to repay their loans – ever. That’s a different move than defaulting, which is what happens to the majority of student loans as students struggle with making payments for a while and then simply stop. The Corinthian 15 have taken a very public stand that highlights both flaws in the student loan system and in the Band-Aid efforts to help indebted students. Student loan debt hit student of all kinds, ages and educational paths. Rising tuition in traditional four year and community colleges have forced more and more students into debt to complete their education. Though millennials fresh out of college are the most obvious face of the student loan crisis, older career changers are also being hit hard, and so are seniors who have unpaid debt from college days long ago. The problem is even worse for students in the rapidly expanding for-profit educational systems, which typically feature workplace oriented training in fields like technology and health care. These institutions typically target the “non-traditional” student: low income, minorities, single mothers returning to school, or veterans starting anew career after leaving the military. For-profit schools, like their state sponsored and nonprofit counterparts, offer students financial aid in the form of federal student loans, backed up by private loans when those don’t cover all costs. Schools pressure students to take out large loan packages, and, say students, pressure them to stay enrolled so they have to keep on taking out more loans. The dropout rate for students in for-profit colleges is high – typically much higher than in traditional schools. Students in these programs often aren’t familiar with the world of college, or have work and family commitments that make it hard to attend. But even if they leave school without completing the program, they still owe on the loans – and the school keeps the money. That’s what the Corinthian 15 are talking about in their refusal to pay back loans that they say were predatory and unfair in the first place. The Corinthian College system is now collapsing, and if it closed, their debt would be wiped clean. But the US government is stepping in to restructure Corinthian in a new direction – and as long as it’s viable, their debts to it will still be outstanding. The problem with Corinthian Colleges is an extreme example of the issues facing indebted students, whose struggle with debt can compromise their earning power, credit and lifestyle choices for years to come. Students deep in debt can’t buy houses, take out loans for major purchases, or in some cases even pay rent. Compromised credit from loan defaults can hurt job searches. New graduates may postpone marriage and children as they struggle to get out of debt. Current debt relief efforts don’t help much. Government backed loan forgiveness programs are available but not for all. Current forgiveness and loan restructuring plans are offered mainly to holders of federal loans, not private ones – and then only after payments have been made for a period of years. Outright forgiveness is offered, but only to those who choose certain public service careers. For those whose loans are mostly private, few options are available – and the debt can devolve to family members who have cosigned. Private debt assistance efforts such as the Debt Coalition, which buys the loans of needy students who can’t pay them off, are springing up around the country, but their efforts aren’t making much of a dent in that $1.2 trillion. The Corinthian 15’s stand comes at a time when educators, financial experts and economists are calling for a better way based on a model of public, tuition free education for all. Better use of educational subsidies and funding, they say, would make college more affordable and accessible and reduce the impact educational debt has on the housing market, employment and the economy as a whole.